Dr. John Pope, associate director of critical care, accepts the 2013 Distinguished Service Award, presented by Mr. Considine on Jan. 23. By the time he started high school, Dr. John Pope had found his calling. Growing up in Cleveland, Ohio, he recalls listening to his grandmother, a pediatric nurse, telling stories of her patients. His neighbor was a doctor, a father to 7 children and one of his role models. His older sister was a nurse. He enjoyed subjects like biology and physiology. So, the decision to pursue a career in medicine was as natural as breathing. 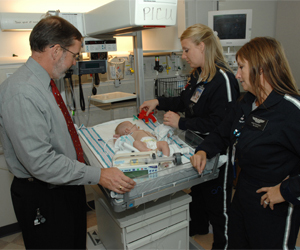 Dr. Pope finds working in the pediatric ICU challenging, yet rewarding. During residency at Rainbow Babies and Children’s Hospital, he was drawn into pediatric critical care, diverting him from his original path, pediatric anesthesiology. He joined the Akron Children’s team in 1998. 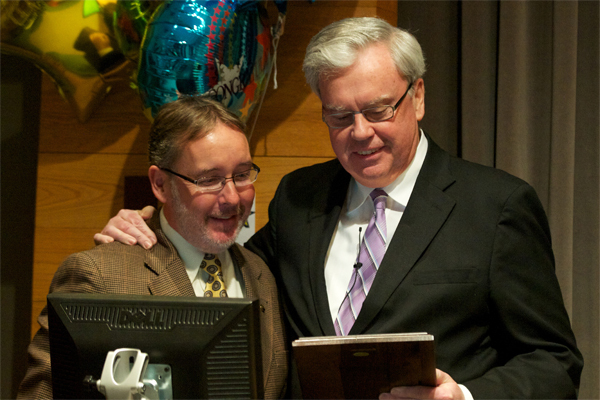 Recently, Dr. Pope received the highest employee honor at Akron Children’s Hospital – the Distinguished Service Award. Candidates are nominated by their peers based on their outstanding contributions in leadership, dedication and service above and beyond their job responsibilities. Dr. Pope attributes a lot of his success to Dr. Robert Klein. Now retired, Dr. Klein served as head of pediatric surgery and was the 2003 winner of the Distinguished Service Award. Since 2010, Dr. Pope has brought his compassionate, can-do spirit to Haiti, where he has traveled 5 times on medical missions to St. Damien’s Pediatric Hospital with Dr. Jeff Kempf. Dr. Pope educates St. Damien’s ICU staff on new medical equipment. 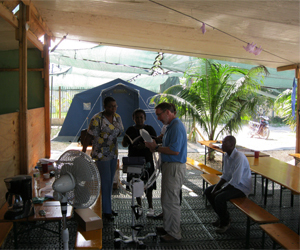 Dr. Pope continues to be amazed by what the Haitians can do with the limited resources available. 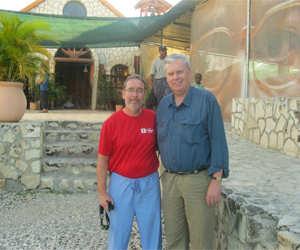 It’s his gentle and caring manner that made Dr. Pope an obvious colleague for Dr. Kempf to take on a Haiti mission trip. In the summertime, Dr. Pope also volunteers at Fresh Air Camp for children with respiratory issues as well as Dreamnight at the Akron Zoo, an event for children with chronic medical conditions. When he’s not working or volunteering, Dr. Pope spends time with his wife of 31 years, Sharon, and their 2 sons, Shaun and Ryan. He’s also an ultra runner and his next goal is to complete a 100-mile run. While in Haiti in 2010, Mr. Considine shared a tent, and a few laughs about rats, with Dr. Pope. On and off the job, Dr. Pope has found his place. And it’s a good thing too. Dr. Pope continues to touch the lives of patients, families and coworkers every day. Couldn’t have happened to a more deserving person. Congratulations to John!